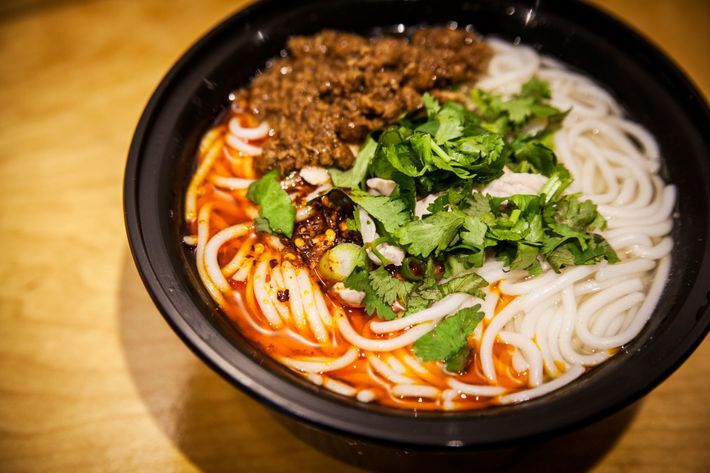 New York’s noodle slurpers have long descended on the East Village block of First Avenue between 10th and 11th Streets, where any night of the week, you’ll see them pacing the sidewalk outside David Chang’s pioneering Momofuku Noodle Bar. These folks have been joined, recently, by starchy-food aficionados of another sort: those pursuing the rarer, more elusive pleasures of mixian, a rice noodle of China’s southwesternmost province, Yunnan, which happens to be the featured attraction of Little Tong, a noodle shop that opened four doors up from Noodle Bar in late March. The restaurant — a first venture from Chengdu-born wd-50 alum Simone Tong — has already established its own appealing identity. 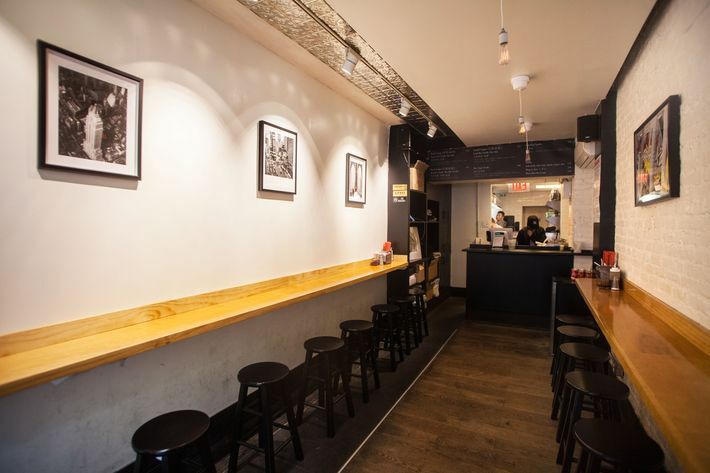 There’s a gracefulness to the slatted-wood (dare we say Momofukian?) design, and a light touch on the volume knob of the classic-rock soundtrack. An antique credenza displaying the menu sits in the vestibule, and there are vases filled with orchids in the windows. Instead of Momofukian images of young John McEnroes hanging on the walls, there are paintings and a choking poster featuring panda bears. And then there’s the menu, which eschews the gutbusting tonkotsu broths of the precinct’s surrounding ramen shops for the comparatively lighter, often intriguingly sour, more easily digestible soups of Yunnan province that combine soft, slick rice noodles with pickled and fermented vegetables and bushels of herbs and edible flowers. These thoughtfully composed offerings don’t qualify as diet food, exactly; the pork broth in the Little Pot Mixian, after all, is a three-day job involving pork bones, prosciutto, and something called bacon skin. But it must be said that finishing a bowl of noodle soup that doesn’t require a week of bed rest afterward is something of a novel sensation these days. As you work your way through the menu, a pattern becomes evident: Each bowl, be it a soothing chicken-and-tea-egg number or a Sichuan-inspired mala dan dan heaped with crushed peanuts, seeks harmony through a different, intricate combination of pickled vegetables, flavored oils, aromatics, and chile-pepper condiments. With the exception of a laksa-like bowl of cold noodles undone by slightly mushy shrimp, they find it. 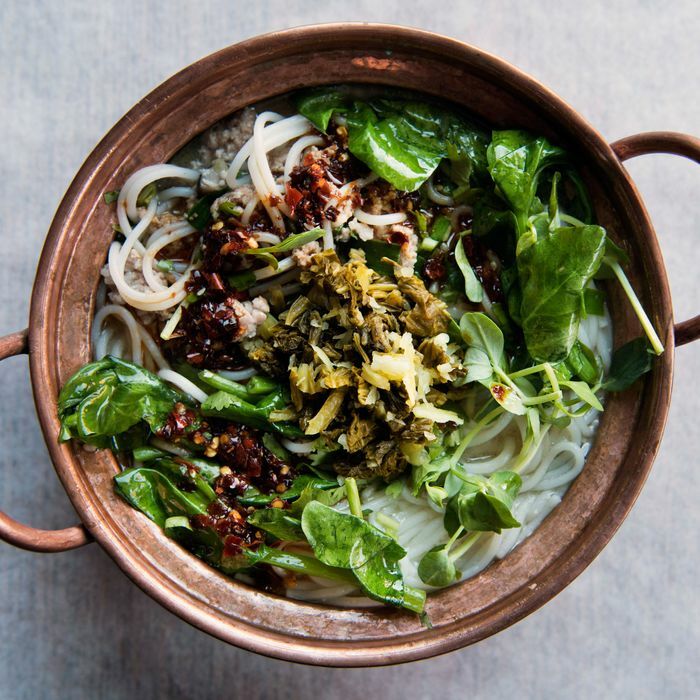 Even the “little eats” that precede the noodles distinguish themselves—the house pickles with a tinge of sweetness to balance the spice, the soy beans not just warm but nicely charred in a hot pan. 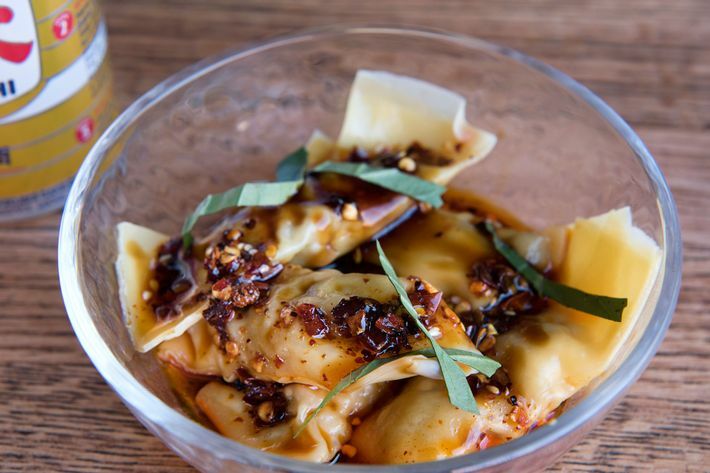 There are Sichuan-style wontons unusually shaped like little pillows and as good as any you’d hope to find in Flushing, and an invigorating shredded-chicken salad bright with pickled onions, fermented chiles, and crunchy mustard seeds. 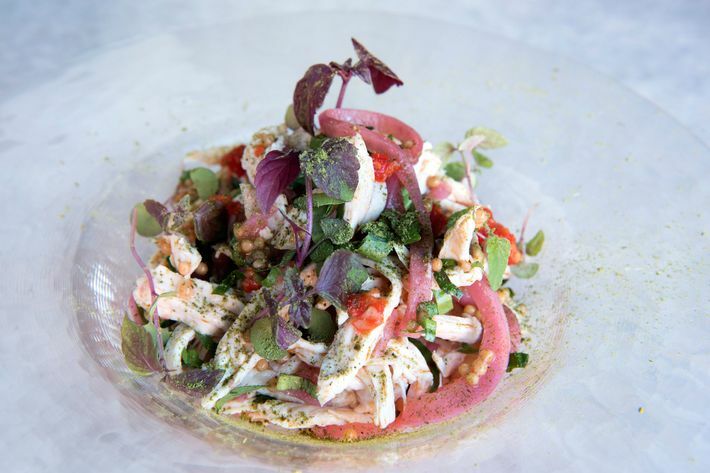 Jaded tartare fans might find Little Tong’s wanting for acid and textural contrast, and the salmon roe dotting the surface of egg-white-drop soup could be said to detract more than it adds. But how many soups do you need in one meal, anyway? If there’s one thing Little Tong shares with its noodle-shop brethren, it’s speed: The place is small and fills up fast, and to turn tables, your friendly server will inform you that the only dessert available right now is a to-go bag of almond cookies that arrive with the (service-included) check, a none-too-subtle hint that once you’ve slurped your last mixian, it’s time to move on. 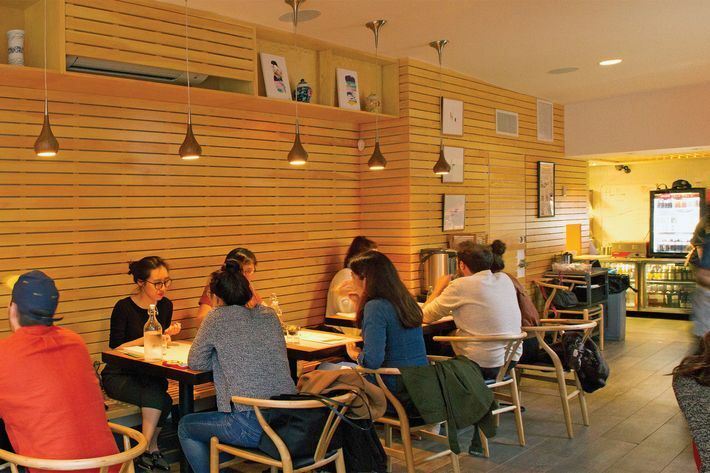 a five-item menu, and judging by the crowds of budget-minded NYU students and a mailman on lunch break the other day, it seems to have found its market. The same cannot be said of the meat toppings, though, which all register on the chewy end of the spectrum. 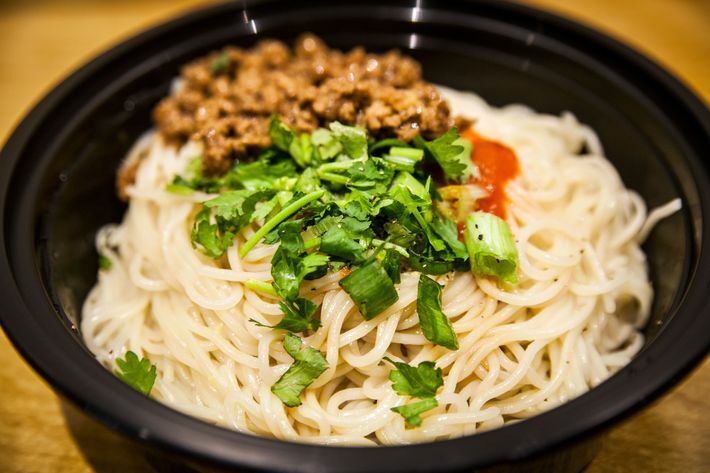 The exception is the ground seasoned pork (which Tang calls a sauce), a component of the Rice Noodle’s two best dishes: the pork noodle soup and Mrs. Tang’s Noodles. And who is Mrs. Tang, you ask? None other than the proprietor’s ex-wife, who cooked the home-style dish for him before he opened the shop, and even before they were married. A menu outlier, it’s made from wheat noodles, not rice, stir-fried with Sriracha. “This is awesome,” Tang remembers telling the future Mrs. Tang the first time he tasted it. “If I open a restaurant, I’ll put it on the menu.” As tributes go, it’s one of the tastiest. Ideal Meal: Ghost chicken, pork wontons, and Little Pot Mixian. Note: The $1.50 side order of fermented chile is worth the extra charge. Prices: Appetizers, $4 to $13; noodles, $14 to $17. Scratchpad: One star for not being another ramen shop; two more for the delicious, complex, artfully composed plates and bowls. Ideal Meal: Pork soup or Mrs. Tang’s Noodles. Note: Tang is already scouting another student-friendly location near his grad-school alma mater, Columbia. Scratchpad: One star for the noodles; one for the quick service.